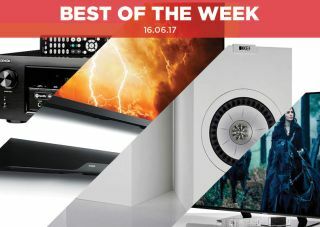 Best of the Week: KEF Q350 review, Panasonic OLED, affordable Denon AV amp and more | What Hi-Fi? This week Sharp began the process of suing Hisense for making shoddy TVs under its brand name, Moon unveiled Neo Mind, a network device that promises to play music from any source and Yamaha announced the YAS-207 soundbar, the first to feature DTS Virtual:X technology. For reviews we have an exclusive of KEF's Q350 speaker, Panasonic's TX-55EZ952B OLED TV and Denon's AVR-X2400H AV amplifier. Japanese TV manufacturer Sharp is none too happy with Chinese TV manufacturer Hisense. The two companies signed a licensing deal in 2015, allowing Hisense to sell TVs under the Sharp name. Sharp, however, claims that the quality of TVs has been poor. Hisense uses the Sharp name in the US, so this could be a ploy for Sharp to regain its name in that territory. We'll have to wait and see what happens as Sharp's lawsuit hasn't made it to court yet. Moon has unveiled the Neo Mind, a network device that promises to stream music from practically any source. It can stream from Tidal, Deezer and Qobuz and can play WAV, FLAC, ALAC, AIFF, AAC, MP3, WMA and Ogg Vorbis files up to 24-bit/192kHz. It's available now for £1700. Yamaha's new soundbar, the YAS-207, is the first to include DTS Virtual:X technology. What does Virtual:X do? It recreates surround sound without additional speakers; in theory it's able to create the effect of a 7.1.4 set-up with just one speaker. There isn't a UK price yet, but it's expected to go on sale in July. "The Panasonic TX-55EZ952B is a straight-laced and serious TV aimed at the serious enthusiast"
The most affordable member of Panasonic's new OLED family, the EZ952 is less for the average consumer and more for the home cinema enthusiast. You'll need to persevere with the settings to get the best PQ, but once done this TV has a detailed, balanced and natural picture. The biggest problem is the HDR performance, which is weak. The set doesn't deliver the contrast and brightness we've come to expect and, in that respect, it lags behind its rivals. "These KEF Q350s are astoundingly good speakers for the money"
The Q350s are the latest in the Q series range and they are astoundingly good speakers. The clarity and detail on offer is exemplary and the sheer size of the sound is impressive. The Q350s have undergone a thoughtful redesign and it shows. They're not the best at low volumes and can't quite compare to the Dynaudio Emit M20's energy, but in every other regard the Q350s are amazing speakers. "Denon’s new amp is defintely the one to beat"
Denon's latest affordable amp is not a huge step up from last year's AVR-X2300W, but it is another strong performer. The AVR-X2400H covers all the bases with an exhaustive spec list so there's no worrying on that front. The performance is crisp, detailed and agile but, compared with some rivals, the sound is not as big or as muscular. Even so, with its exciting sound and raft of features, the Denon is the affordable amp others need to beat.